It seems we have a new member of our solar system, and it may be ten times more massive than Earth. Earlier this month, NASA issued a press release stating that it’s likely that our solar system has a ninth planet—even if it’s proving difficult to find. The planet could have a mass ten times that of Earth’s, and be situated twenty times as far from the sun as Neptune. It’s being referred to as “Planet Nine,” and while it’s very difficult to procure clear evidence of its existence, some scientists are absolutely convinced that it’s out there. “There are now five different lines of observational evidence pointing to the existence of Planet Nine,” said Konstantin Batygin, a planetary astrophysicist at the California Institute of Technology (Caltech), who is part of a team on the search for the planet. In a 2016 paper, Batygin and co-author Mike Brown detailed six known objects in the Kuiper Belt that behave rather strangely. All of them have elliptical orbits pointing in the same direction, and all of those orbits are tilted the same way. Both of these traits serve as clues to the presence of Planet Nine. Computer simulations that took the hypothesized planet into account indicated that there should also be several other bodies with more extreme tilts from the solar plane, on the order of 90 degrees. Brown realized that astronomers are already aware of five such objects, meaning nature did fit with the simulations. Planet Nine would also explain why the plane in which the other planets orbit is tilted about six degrees away from the sun’s equator: over time, Planet Nine’s distant gravity has made the entire solar system plane wobble away from center. Finally, there are the objects in the Kuiper belt that orbit in the opposite direction of everything else in our solar system. Based on the behavior of these distant objects, the astronomers believe the planet to be a Super-Earth, a massive rocky planet that is extremely common in the universe—but which our solar system, oddly, lacks. The planet could have coalesced out in the cold reaches of our system over millions of years, formed close to the sun and then been flung outward, or even been captured by the Sun from another system. Batygin and Brown are using the Subaru Telescope at Hawaii’s Mauna Kea Observatory to continue their search for Planet Nine. According to Batygin, this telescope is the best tool available to hunt down something dim and distant in the vast expanse of sky. However, Planet Nine isn’t the only explanation for the orbital behaviors observed. 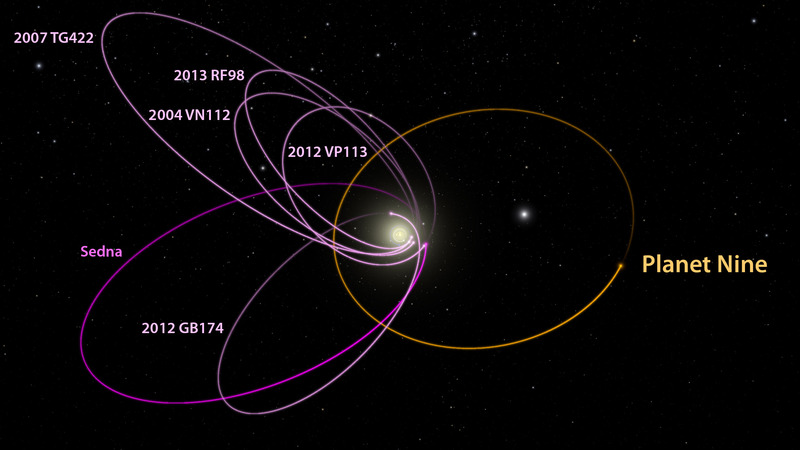 A recent survey of the outer solar system found over 800 trans-Neptunian objects. A random distribution of this matter could also potentially have the same effect on the tilt on the traits observed in various orbits—but the jury is still out.